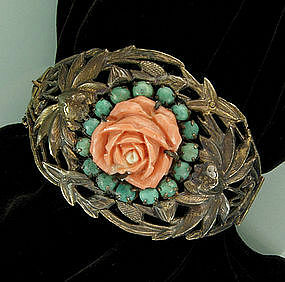 Stunning vintage hinged bangle in openwork silver, with an angelskin coral carved rose surrounded by turquoise cabochons. The silver is worked in beautiful dimensional flower and foliate designs. Marked CHINA, and STERLING. Circa 1930. With a slide clasp and safety chain. The silver has a dark aged finish and appears to have a gold wash. The color of the coral is warmer and brighter than the photos depict. A rare Chinese piece, outstanding and very wearable. Great size -- 1 3/4 inches wide in the center and 7 inches inside circumference. Excellent condition. Photos enlarged to show detail.